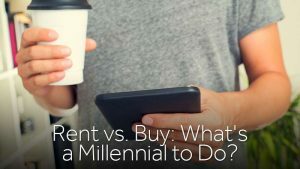 Home / Rent Vs. Buy: What’s A Millennial To Do? Following the housing crisis, many homeowners changed their perspectives on homeownership and explored renting as an option. While there is still some hesitation about buying, there is evidence that millennials are beginning to consider homeownership more seriously. In 2015, 32 percent of homes were purchased by first-time homebuyers and one-third of them were 35 years old or younger. So is it time to say goodbye to renting and hello to mortgage payments? We’ll break down what millennials should consider when deciding between renting and owning. Homeownership provides stability, but as a millennial engaged in building your career, it might not provide you with the flexibility you need. Let’s say you get promoted or transfer to a new location. This means you need to move, and fast. Trying to sell a home quickly can put you at a disadvantage financially if you don’t have the luxury of waiting for the best offer to come by. Renting definitely offers you a bit more flexibility if you’re at a mobile point in your career. It generally takes about five to seven years at moderate appreciation levels to recoup the costs associated with the purchase of a new home. One of the first things you need to figure out is if you’re willing to stay put for at least five years. 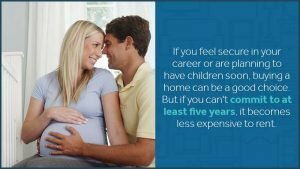 If you feel secure in your career or are planning to have children soon, buying a home can be a good choice. But if you can’t commit to at least five years, it remains less expensive to rent. One of the best perks millennials see in renting is all the included amenities — dog parks, community gardens, a fitness center, tanning salon and swimming pool are all things you can get when you choose to rent at a nice apartment community. Not to mention if something goes wrong, the landlord and maintenance crew will swoop in to save the day. Owning a home means taking on a lot of responsibility, like mowing the lawn and fixing leaky pipes. If you’re not willing to put that kind of work into your dwelling, you’re better off sticking to renting for now. Whether you’re moving into a new apartment or buying your first home, Zippy Shell can help make it a smoother ride. Our portable moving and storage solutions make moving a breeze. We’ll deliver a portable container right to your doorstep. Once you’ve packed away all your things, simply give us a call and we’ll be there to pick it up and deliver it to either your new home or storage unit. Yes, moving can really be that easy. Still not convinced? What if we told you Zippy Shell beats the competition’s prices by up to 20 percent? Moving with Zippy Shell is more convenient and more affordable. Give us a call today and we’ll send you a free quote for your upcoming move.